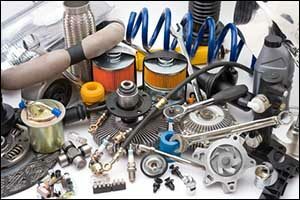 LaCava Brothers Auto Supply carries a huge selection of automotive supplies. One of the more frustrating aspects of doing your own auto repair is trying to make sure that you get the best prices from a local auto parts store. There are lots of places that seriously markup the prices for parts, turning a simple $5 piece into something that will set you back ten or a hundred times as much retail. The best way to combat this is to work with a trusted supplier for your Fall River, MA car parts. LaCava Brothers Auto Supply has proudly served customers in the Greater Fall River area for over 70 years. We take pride in offering our customers top quality auto parts, tools, products, and accessories. It is important to know what you are getting – comparing apples to apples and oranges to oranges. So to ensure that we are providing our customers with the very best prices, we will match any verifiable price on ANY item that our local Fall River competitors have in stock, provided that the merchandise is the same brand. We do reserve the right to limit quantities, and this guarantee excludes special orders, manufacturer’s rebates, closeouts, and all going-out-of-business sales. Our Lowest Price Guarantee is only applicable to non-commercial customers. See our website for DETAILS on our price match guarantee. In addition to shopping at LaCava Auto Parts and taking advantage of our low price guarantee, there are other ways to save when you visit an auto parts store. Take time to do your research before you buy. So many DIY auto repair jobs run over budget due to purchasing the wrong parts or accidentally buying multiple items when you only need one or two. Make sure you double-check the make, model, and year of your vehicle. In some cases, even the place where the vehicle was manufactured can make a difference, such as foreign brands made in the USA versus the same brand made overseas. Not sure? Contact our auto supply in Fall River and speak with one of our team members to ensure you get the right Fall River, MA car parts the first time. Don’t be afraid to ask about specials. You can visit our website, but make sure to ask an employee when you come to LaCava Auto Parts about any specials that we might be running at our local auto parts store. If you find the same part made by the same manufacturer at another store in the Fall River area, make sure to let us know. Our team can explain the policy for our price match guarantee to ensure that you get the best deal possible. Beware of deals that sound too good to be true. You might find parts and tools on social selling websites, but be careful. These websites have been used by criminals for dealing in stolen parts and have been known to sell parts that are in less than perfect condition. Your safety and the safety of everyone who rides in your vehicle is riding on the quality of the parts you choose, so it pays to be careful. Another tip is to visit LaCava Auto Parts in person. If you are buying an expensive part or are looking for a rare part for an older vehicle, make sure to come in and talk with our staff in person. Don’t just order something online and get stuck with something that won’t work. While some parts might only be available through the manufacturer or obtained through a third-party seller who carries hard-to-find parts, you might be surprised to discover what we can order for you at our auto parts store. We are open seven days a week, and you can call us any time to hear our hours of availability. The best way to make sure that you are getting a good deal on auto parts, tools, accessories, and supplies is to work with a trusted store. 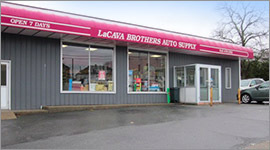 LaCava Auto Parts has provided auto supply in Fall River for over 70 years. We have worked hard to earn a solid reputation with individual customers and professional auto shops and service providers throughout the Greater Fall River area. We also provide essential services, including rotor turning and hydraulic hose servicing. Our goal is to provide our customers with the products they need to achieve their goals, whether that means getting an older car up-and-running or keeping the family car safe and on the road. Give us a call at 508-676-1951 or stop by our location at 1262 Bedford Street in Fall River, Massachusetts.